Saving, efficiency and reuse: those are three key words that describe the management of water resources in a “circular” perspective. In particular, the SWAMP project is focused on the first two and tries to provide smart solutions for water utilization in agriculture. 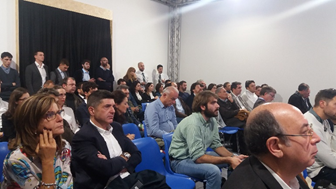 These and others innovative technologies were discussed last Wednesday, November 7, 2018 during the seminar ” Efficient and sustainable management of water resources in agriculture” that was held at the Ecomondo fair in Rimini, Italy. Now in its 23rd edition, ECOMONDO is the leading trade fair in the Euro-Mediterranean zone for all sectors involved in the circular economy. During the event, all the areas of the green economy are represented, from the recovery of materials and energy to the sustainable development, and all the involved stakeholders take part: industries, start-ups, universities, ministries and research institutions meet for a dialogue aimed at boosting innovation towards the efficient use of resources. A whole pavilion is specially dedicated to water, the Global Water Expo, where a wide program of conferences explores the latest technologies and approaches for the best use of such resource in terms of efficiency in all sectors. Among these, the agricultural field stands out both from a quantitative and a qualitative point of view: according to the OECD, agriculture uses about 70% of the water withdrawn in the world today and also contributes to water pollution due to excess nutrients. pesticides and other pollutants. Moreover, in a short to medium-term scenario, the growing pressure from urbanization, industrialization and climate change will generate greater competition for the exploitation of water resources for the agricultural sector. During the seminar “Efficient and sustainable management of water resources in agriculture” some of the research efforts from the last few years have been presented. All of the exposed works try to address the problem by following two different approaches: the first one is based on the reuse of purified wastewater for irrigation in order to increase the availability of water resources; the second one aims at developing efficient irrigation systems for a rational use of water. The SWAMP project is placed in this second strand: within this framework, the objectives of the project and the actions undertaken in the various pilots were shown, highlighting the specific needs of each area. Special emphasis was given to the Italian case study, to the possibilities offered by the IoT approach and to the challenges faced with the integration of data from sensors and models in the platform. 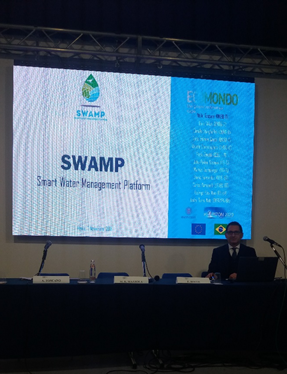 The symposium was an opportunity to share experiences similar or complementary to SWAMP, and, the comparison with them can generate new ideas and improvements for the project.